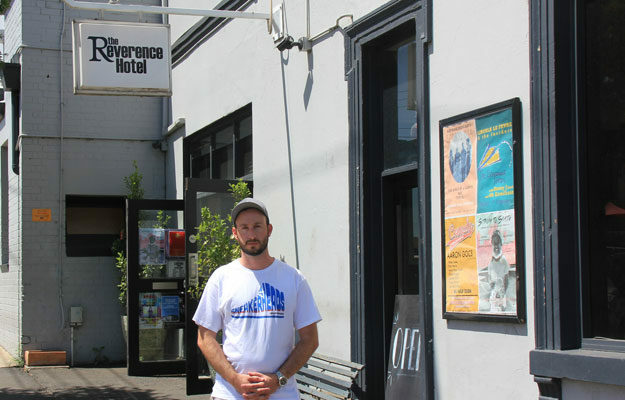 The Reverence Hotel in Footscray is closing in March and this has been devastating news for the community and live music scene. Built in 1876, the pub was once called The Exchange until Matt and Mel Bodiam revitalised the venue in 2012 renaming it The Reverence. Like many historic pubs in Melbourne, there are no heritage protections in place to protect the building, although a Heritage Council report previously found the site was of “archaeological significance”. Whatever it’s future holds, it is likely the building will be compromised. The Reverence has played an important role in providing a platform for people to experience live music in the inner west. It has hosted a vast range of music events and has given local artists a chance to showcase their talents. With no security of tenure or an option to renew the lease for the long term, Matt and Mel do not have the certainty they need to continue investing back into the business and do not own the building. Last year, the hotel’s owners had the site on the property market and a growing trend in Footscray seemed to be continuing; the advertising on the billboard was pitched at developers for $3.5 million, stating that there was ‘potential to build to up to six levels’. Footscray/Braybrook locals Al-flex and Vision (of the hip hop group Sneakerheads) have a deep connection with the venue as they have not only played shows there but also have organised their own gigs at ‘The Rev’. The first show they organised there was back in May 2013. The news that the pub is closing has caused Al-flex and Vision to put on one last hip hop show on Friday 1st February with the hope that the public can send off the venue in style and celebrate how lucky we all were to have such an institution in the area. “The owners Matt and Mel have done so much for this community over the last six and a half years and we want to show our appreciation for all they have given. It’s been a part of our lives for so long and we were shocked when we found out the news. In the future my group Sneakerheads will plan to play more gigs locally although no venue will ever compare to The Rev. We will be releasing our first self-titled album this year so stay tuned!” Al-flex said. Is there any legal way way we could preserve the historical value of the building?